A fun escape that involves murder, mystery and interaction is now available for those wanting to add an entertaining break or a quizzical thrill to their dinner plans, courtesy of two Southern Illinois University Edwardsville alumni. 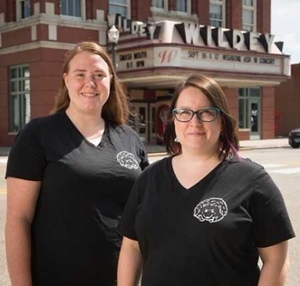 Libby Sykes and Jessica Napier, creators of Sly Hedgehog Productions, will debut their Murder Mystery Dinner event from 6-10 p.m. Saturday, Sept. 2 at Wildey Theatre in Edwardsville. The Sept. 2 show is sold out. Sykes and Napier have scheduled dinner events throughout the year. To register and buy tickets, visit Sly Hedgehog Productions. Tickets are $65. “Our Murder Mystery Dinner is a great way to spend an evening that incorporates intrigue, suspense and drama, while you have an enjoyable time with friends or family,” Sykes said. “We knew we both enjoyed murder mysteries and escape rooms, and that there was nothing like this in our area,” touted Sykes. Sykes earned a bachelor’s in English education from SIUE in 2014 and is working on a master’s in social work at SIUE. Napier received a bachelor’s in biology in 2014 from SIUE and is working on a master’s in biology at SIUE. Sykes and Napier met in 2009 as graduate assistants working in SIUE’s financial aid office. After discussing murder mystery ideas for several years, the duo began earnestly working on their business plan in May 2017. They devised their events to work as follows. A theme is selected and advertised for each Murder Mystery Dinner, and guests are encouraged to come dressed to reflect it. Dinner is served first. Guests choose their seats at a table of 8, and the people they sit with become their team. Each person receives a packet of information, clues about a “murder” that has occurred and team challenges. Clues are also available for everyone on the “evidence table.” Dinner guests then transform themselves into detectives to both solve the crime and receive as many points as possible. The winner of the Murder Mystery is not necessarily the team who discovers the killer, as several people could do so. The winner is the team with the most points, which can be obtained in several ways. SIUE alumni have launched an interactive Murder Mystery Dinner event through Sly Hedgehog Productions. Shown from L-R are Jessica Napier and Libby Sykes.